It’s Friday — which means it’s time to wrap up one quality week at Headlines! 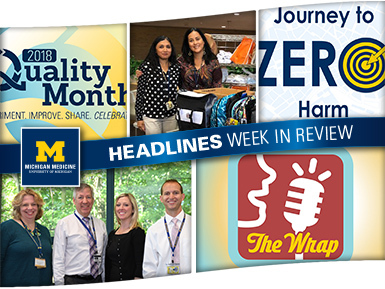 The newsletter kicked off Quality Month by giving readers details of a daylong event designed to celebrate improvement work across the organization. Faculty and staff also learned about a quality initiative that will help limit patient harm and improve the overall safety culture at Michigan Medicine; employees took a look back a successful school supply drive to help community members in need; and the finance leadership team shared why their role is so important in carrying out the organization’s three-part mission. Every October, Michigan Medicine celebrates Quality Month to highlight and recognize improvement work going on around the organization. This year, however, the Quality Department is expanding its celebration, holding a daylong event later this month at the North Campus Research Complex. Learn more about the event and how colleagues can learn from each other’s vital work and experiences. The organization recently announced plans to enhance its patient safety culture. To begin this quest, Michigan Medicine has partnered with Healthcare Performance Improvement, a leading patient safety consulting firm. The collaboration will involve a three-year journey aimed at reducing preventable medical errors. Click through for details and find out the role every employee can play as part of this initiative. The numbers from this year’s annual Michigan Medicine school supply drive are astounding: 402 backpacks, 161 boxes of supplies, hundreds of pairs of socks and underwear, and enough dollars to fund Maggie’s Marketplace at the Ypsilanti Health Center for more than two months. Find out more about the record-setting drive, as employees once again put their generosity on full display! Last week, Headlines readers were given an in-depth look at the Department of Finance; this week, it was time to meet some of the individuals who lead this important team. Headlines recently sat down with the three current permanent associate chief financial officers to discuss their roles and how they help colleagues carry out ideal patient care, education and research. Check out what they had to say!